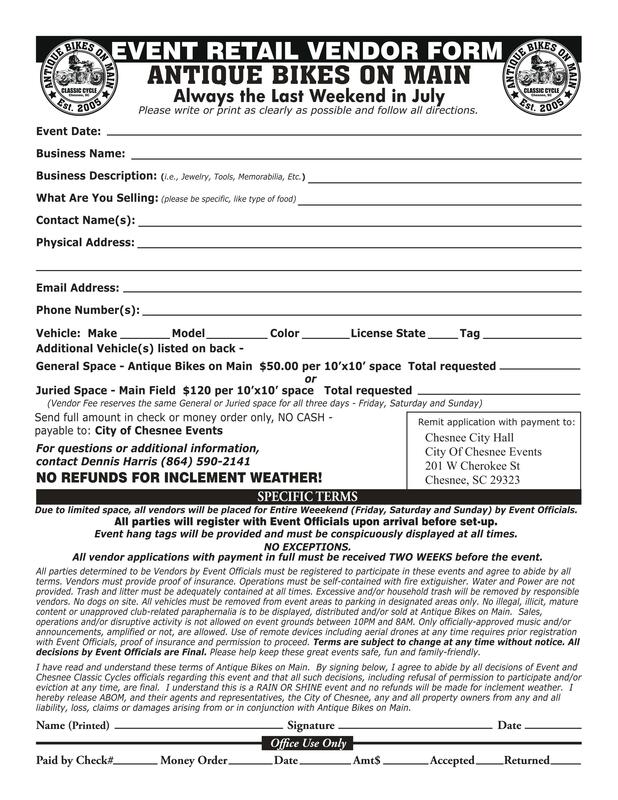 "Always the Last Weekend in July"
to download the Vendor Application Form. Sponsored by the City of Chesnee, SC. Since 2005, Chesnee Classic Cycle has been home to the annual Antique Bikes on Mainrally. All kinds of motorcycles and enthusiasts come in a real downtown venue. Saturday's Prayer Ride- kickstands up at 1PM- tours the area before coming back to Chesnee for Christian fellowship into the evening. Our very own local AMCA Legends Chapter http://amcalegendschapter.com/ will once again be a big part of Antique Bikes on Main. Become a Legend today and ride with the rest of the best. The Wall of Death Motordrome is coming back to Antique Bikes on Main in 2019. The Rebel Hell Riders will be performing all weekend! Sgt Mikey and his daredevil crew will bring their fire breathing, death-defying performance machines to ride sideways on their motordrome wall into the history books of Antique Bikes on Main. 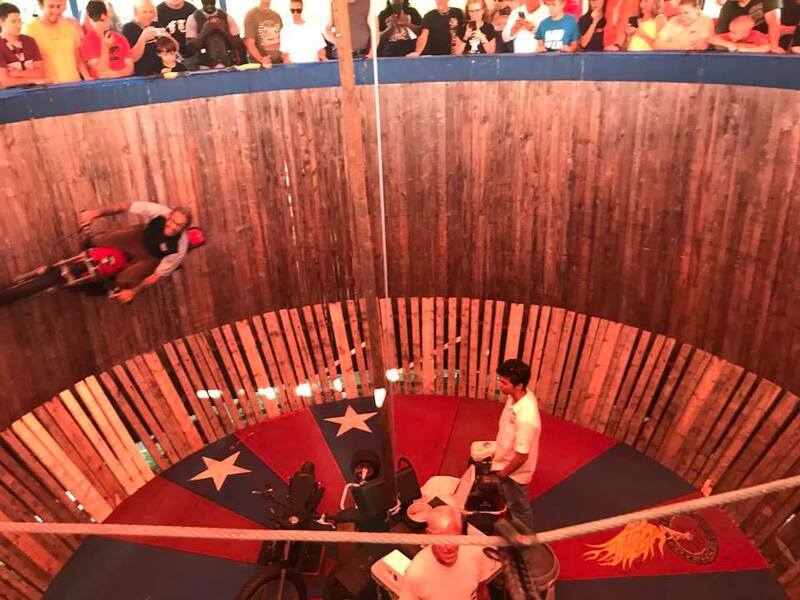 Last year, THOUSANDS of people saw the Wall of Death performance. So we're doing it again this year. Sgt Mikey's crew will be riding for your tips. This isn't Reality TV special effects or a petting zoo where you or the kids can feed some corn to the sheep. Bring some nice green money, hold it out and watch these gravity-defying Masters of Motorcycle Mayhem grab it while they roar by riding on the wall. How cool is that?!? Antique Bikes on Main is the best rally anywhere. We're going to have a great time. Live music and totally free carnival rides, all weekend long. Lots of vendors, free parking and no admission. No gimmicks, no wristbands, no tickets- no kidding! Chesnee wants you to come and have a great time. One big event- completely free- all weekend long! It's motorcycle parking only on Main Street, especially on Sunday with designated areas welcoming motorcycles of specific vintages. If you come on four wheels, with or without a trailer, there's plenty of parking on the side streets around back. Visit Chesnee's famous Bantam Chef for a Chili Cheese-a-plenty in AIR-CONDITONED COMFORT while you tour the display of 50's era motorcycle and automobile memorabilia. Other Chesnee Restaurants including El Limon Mexican, New Century Chinese, Yoshi's Japanese and Pizza House offer their specialty menus and a/c, all in walking distance. You never know what kinds of bikes you'll see. You never know who you'll meet. Bring your bike, even if it doesn't run or look pretty, and help make Antique Bikes on Main even better this year. This isn't a TV show or high-dollar performance. This family-friendly event is for people that love bikes. It's guaranteed to be hot in South Carolina in July, but Antique Bikes on Main is worth the trip! All true vendors (food and new items), as determined by Antique Bikes on Main officials, will be required to complete a Vendor Form (above) and submit payment. One fee covers your space, good for both events for all three days. It's one of the best deals you'll find anywhere. Check in at EventHeadquarters Tent in front of Chesnee Classic Cycleat 102 East Chester Street to fill out a form for consideration when you arrive if you do not pre-register or to be shown to your approved spot. Our Swap Meet is FREE!-NO admission, parking fees, space fees or tricks. Sellers are only required to register by completing a vendor form (above). Check in at Event Headquarters Tentin front of Chesnee Classic Cycle at 102 East Chester Street to fill out a form when you arrive if you do not pre-register or to be shown to your approved spot. To keep as many people happy as possible- you AND us- as the Swap Meet grows and grows, there will be improved organization in 2019. We want it to be even better. The 9th Annual Prayer Ride will meet at Chesnee United Methodist Church on Saturday July 27, 2019 with kickstands up at 1PM! After a great ride through two counties, riders will return to downtown Chesnee for Christian Music and Fellowship into the evening. Come relax in our beautiful small city and enjoy dinner at one of our many restaurants. Visit Chesnee's famous Bantam Chef for a Chili Cheese-a-plenty in AIR-CONDITONED COMFORT while you tour the display of 50's era motorcycle and automobile memorabilia. Other Chesnee Restaurants including El Limon Mexican, New Century Chinese, Yoshi's Japanese and Pizza House offer their specialty menus and a/c, all in walking distance. Contact CUMC's Richard Clemons (864) 804-3030 or CMA Jabez Chapter President Don Cothran (864) 494-0402 for more information about the Prayer Ride. GPS address- 102 East Chester Street Chesnee, South Carolina 29323. East Chester Street will be closed on Sunday, but GPS will take you to within 50 feet of Chesnee Classic Cycle. From Interstate 85- Take Exit 78 in Spartanburg to SC 221 North. SC 221 becomes South Alabama Avenue- which is our Main Street- as it passes through Chesnee. You can also take Interstate 85 Exit 92 in Gaffney to SC 11 and travel west for the scenic ride. After passing the Cowpens Battleground National Park, turn left at second traffic light and you have arrived at Antique Bikes on Main. From Interstate 26- Take Exit 18 onto I-85 North in Spartanburg towards Charlotte, then follow directions from Interstate 85. You can also take Interstate 26 Exit 5 to SC 11 and travel east for a great ride. When you cross the railroad tracks, you're in Chesnee. Turn right at first light and you have arrived at Antique Bikes on Main. Jay's Tavern, a biker-friendly venue just a few miles from Main Street in Chesnee, is now offering Primitive Camping in his fully wooded campground directly behind Jay's Tavern. Pack it in, pack it out and park your bike right in front of your tent. $40.00 for a spot for the entire weekend. You can't beat a deal like that. We're always looking for ways to make Antique Bikes on Main a bigger and better event. Total attendance in 2014 was around 30,000 people, all adding to the local economy. Have you got an idea to help us grow or offer event participants options while they are in the area? We're looking for the right combination of motorcycles and affordable good times, with a motorcycle-friendly scene only Chesnee Classic Cycle and the City of Chesnee can offer. The Motor Maids did. We worked with their schedule and together we made history. Make Main Street in Chesnee the destination of your event. 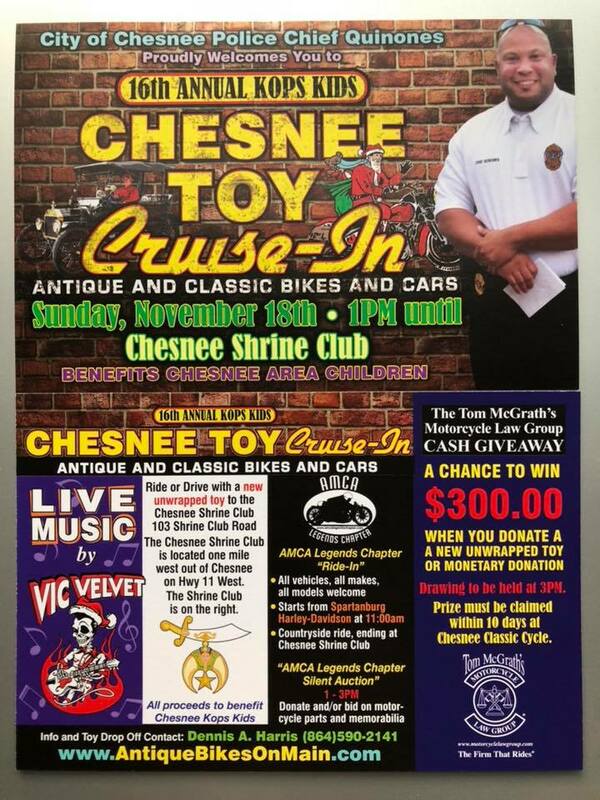 "Always the Last Sunday Before Thanksgiving"
Join Chesnee Classic Cycle for the first Chesnee Toy Cruise-In, our 15th Annual event collecting toys and donations for Kop Kids. Help us raise donations for Chesnee-area youth, to be distributed by the Chesnee Police Kops Kids Charity. Bring a new, unwrapped toy to the Cruise-In or drop one off in advance if you like. Donations sites include Chesnee Classic Cycle anytime or to the Shrine Club on the day of the event. Spend time with us as we MOVE INSIDE to the Chesnee Shrine Club. We'll have live music, warm food and cold beverages. Antique and classic motorcycles and Cars- original to full custom- are welcome. This is a no stress event- after years of riding in the cold and rain, we're ready for something different. Come on out for a great time, before the hectic holidays and winter sets in for good. Since 1993, Chesnee Classic Cycle has been a regional hub for vintage & classic motorcycles, owners and enthusiasts. The shop is housed in the former Potter's Livery Stable, established in 1914 , which is the oldest original timber-framed building remaining in downtown Chesnee. Owner Dennis Harris spent his early years as a flattrack racer and renowned tuner, achieving national success with Norton, Ossa, Ducati, Cagiva, Honda and Harley Davidson motorcycles before retiring to establish Chesnee Classic Cycle in his hometown. The pace at Chesnee Classic Cycle is less hectic nowadays than in past years. Basic service and tires are a primary focus. Older Harley Davidsons are most common. Other marques and projects find their way to us, often when other shops are unable to help. We never got into recent custom trends so popular on television, so terms like "Old School" don't really apply. You won't find neon or an apparel section or a showroom full of bikes for sale. It's more like an old country hardware store, but with men relaxing around motorcycles instead of a pot bellied wood stove. Chesnee Classic Cycle is just a real motorcycle shop. 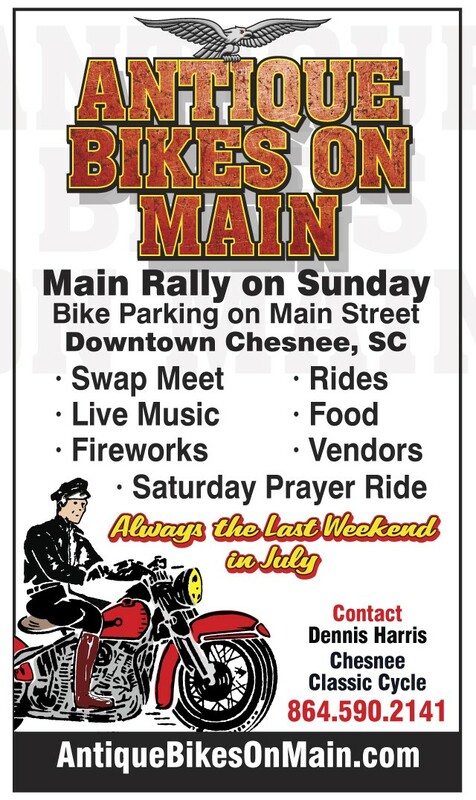 A brief history of Antique Bikes on Main and our mascot "Barney"- Antique Bikes on Main has become the signature annual event of Chesnee Classic Cycle. Ever since the beginning, we have always found a reason to get together with friends- usually with something on the grill, something in the ice chest and lots of friends & motorcycles. Early events focused on specific bikes, like Italian and British brands. In May 2005, we held the first Antique Bikes on Main event open to all bikes. 25 or 30 friends showed up, with about the same number of bikes. Within three to four years, it had moved to "Always the Last Weekend in July", outgrown East Chester Street in front of the shop and taken over the town with 10,000 in attendance. The heat has become legendary. Even so, with the added Swap Meet and Prayer Ride on Saturday, Antique Bikes on Main has become one of the top summer motorcycle events in the region with attendance continuing to climb. We want to keep it fun and free for everyone to attend, old and young. We loved motorcycles when we were kids and we want them to have fun here, too. We also remember when it didn't cost $50.00 just for parking, admission and a cheap plate of food to go to a bike rally. Hopefully Antique Bikes on Main will help remind people that money isn't everything. Our Antique Bikes on Main motorcycle rider logo has affectionately become known as "Barney". In 1947, a good friend of ours named Sam Greenway opened a new Harley Davidson dealership in Fayetteville, NC after returning from World War II. Greenway Harley Davidson operated for about ten years before he let the HD Franchise go as he transitioned to a more profitable Schwinn Bicycle dealership. Mr. Greenway was a regular at Chesnee Classic Cycle for many years. In early 2007, Mrs. Greenway asked us to help resolve the remains of his life long collection of everything two-wheeled as Sam reached the end of a long struggle with Alzheimer's disease. When we finished, she came to us and said, "Thank you for helping. I know this isn't much, but Sam would want you to have this for your shop." She handed us their last new Greenway Harley Davidson green t-shirt from 1955. Barney was on the front of that shirt. When we did our first Antique Bikes on Main t-shirts in 2007, Barney on his old motorcycle was the natural choice and a fitting tribute to our good friends Mr. and Mrs. Sam Greenway. We're usually here at Chesnee Classic Cycle Tuesday - Saturdays after 1:00PM until 7:00PM, sometimes later.